The Brothers Hildebrandt are two of my favourite artists. They have drawn ever since they were two, and are now possibly among the most well known Tolkien artists. They have worked together and separately on many different projects since 1959, and began illustrating Tolkien’s work in 1975. Education and Career: The Brothers began drawing at the age of two, in their early years they dreamed of becoming Disney animators. They both enrolled in Meinzinger’s Art School in Detroit. They began their career in the arts filming documentaries, moving over to illustrating books in 1969. Then began their work on Tolkien calendars in 1975. Since then they have been worked together and separately on many projects, mainly in the illustration field, though they did write and illustrate their own fantasy novel called “Urshurak”. 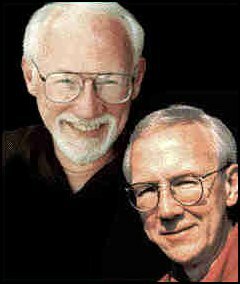 Family: The Brothers grew up in Michigan, moving to New York together in the early 1960’s. They went their separate ways in 1981 and for 10 years didn’t speak to each other, they now collaborate on some projects and live within 25 miles of each other. Greg is married and has three grown children, two daughters and a son. Tim has one son. Other contributions: The brothers have recently released a book of Tolkien art called “Greg and Tim Hildebrandt, The Tolkien Years.” Featuring new and old Tolkien work. The text of the book was written by Greg’s son. Due to the success of this book the calendars are being re-released. Influences: The Brothers were influenced by the Comic strips and books they read whilst growing up. Including Green Lantern, Terry and the Pirates, Steve Canyon, Prince Valiant, Green Hornet, and perhaps a little better known, Wonder Woman, Batman, and Superman. They were also influenced by Walt Disney’s animations, aspiring to work there as adults. Books and films have also been an influence on the Brothers, mainly fantasy and science fiction. Fantasy influences included Edgar Bergen and Charlie McCarthy and from the science fiction genre such films and books as Frankenstein, and George Pal’s When Worlds Collide and The War of the Worlds were a heavy influence. Illustrators such as N.C. Wyeth and Maxfield Parrish have also been an inspiration to the brothers. Awards: Award of Merit and Gold Medal from the Society of Illustrators. The future: The brothers have no plans to give up art just yet. At present they are working on art inspired by the September 11th tragedy. Much of it is on sale at their gallery to raise funds for the 911 relief fund.